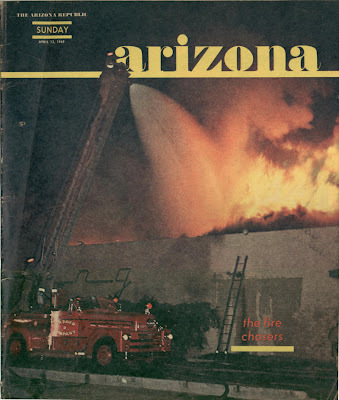 Here's a story that ran in the Arizona Republic's Sunday magazine insert on April 13th, 1969 about how my Dad chased fires. It's corny, It's goofy, but what the hey. I did fix some errors in the original article (bad spelling, wrong names for stuff, etc.). 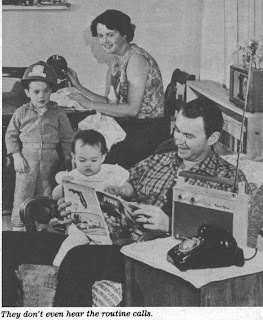 The little lamb Mary had, that went everywhere Mary went, is small lamb chops compared to the portable radio Bob Guildig has. It really goes everywhere. It even goes with Bob and his family to church on Sunday. Why should a man want a radio blowing in his ear in church? Bob Guildig does because he’s completely ape over fires. If a call comes through his earplug in the middle of a sermon, it’s bye-bye preacher. “Nobody can hear anything when I’ve got the plug in my ear,” Guildig explained. “So far we haven’t had to leave during a service. But if a call does come we don’t want to miss it, do we, honey?” Mrs. Guildig nodded. Then she glanced at 18-month-old Kathy and 2½ -year-old Robert on the floor tugging at Daddy’s red plastic hardhat emblazoned with the emblem of the 2-11 Association of Phoenix Fire Buffs, Inc. The radio emitted a dispatch to a trash fire at 1949 E. Garfield. “You get so you don’t even hear the routine calls,” Mrs. Guildig said. “Kathy went to her first two-eleven fire when she was only eleven days old,” Mrs. Guildig said proudly. It was a Saturday afternoon at the Guildig home. The radio chattered again and everyone sat loose. Guildig is a draftsman at Sperry Flight Systems, 15 miles from the heart of Phoenix. Since he’s built like a Dallas Cowboy fullback and is only 27, what’s he doing avoiding the Phoenix Fire Department? Guildig would join the department in a minute if they’d allow him to take colored pictures of fires. Taking pictures is the Guildigs’ thing. To date they have more than 5,000 of fires such as Phoenix Union High School, Phoenix Indian School, Cudahy, Arizona Ranch House, Camelback Lanes to mention only a few in the seven years of chasing fires. Legally and technically, a member of the 2-11 Association of Fire Buffs is different from the casual citizen at a fire only in that a Fire Buff is personally known by almost all the city firemen, is allowed to cross the fire lines (not too far across) and the department sanctions his organization. The red hardhats and surplus firemen’s raincoats are for show rather than utility. A Fire Buff simply is a privileged spectator. Mrs. Guildig excused herself to put the Saturday night roast in the oven. What happens to the roast and potatoes should a 2-11 alarm occur just as they sit down to eat? 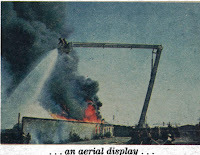 A fire buff’s goal is to arrive on the scene as soon as possible, maybe even before the apparatus. To be able to turn in an alarm on a big fire is the ultimate. Guildig had the supreme thrill one Sunday morning while poking around Park and Swap at Greyhound Park. The portable was on. A suspicious plume of smoke curled into the sky around 33rd Street and Washington. A fire buff knows the color of smoke which has potential flame behind it. The portable remained silent. Bob had a feeling he should investigate. 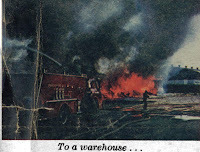 He drove over and saw coming from the interior of the warehouse all the signs he needed to sound the alarm. His series of slides show the blaze from start to holocaust to embers. He admits to a great fascination in watching fires. 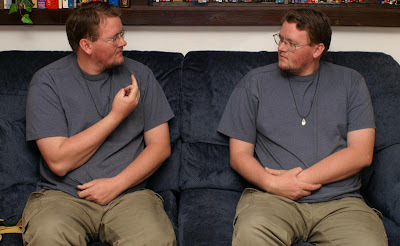 He also quickly stresses the fact that this fascination is pretty universal with people. To a real buff there are other factors. 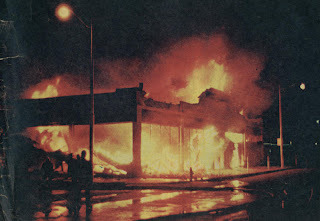 One, Guildig feels he is putting a history of fires on film and someday his efforts will have historical value in the city. Recently a writer on the Coast requested several of Guildig’s pictures for use in a book dealing with fires and fire prevention. Guildig and the 17 other Fire Buffs believe they are a citizen’s booster club for the fire department and many times perform little services that make life a pinch more pleasant. Mrs. Guildig recalls that when she first started dating her future husband, his discussions about being a fire buff made her wonder if she didn’t have a ding-a-ling on her hands. “I listened and decided he had something interesting going and right today I’ll beat him out the door sometimes when we get one (fire),” she said. It is a written bylaw of the fire buffs that all speed limits be observed on the way to a fire. Anyone receiving a ticket for speeding is liable to suspension which could lead to expulsion. In their seven years of marriage and fire-chasing, which Phoenix fire impressed them most? 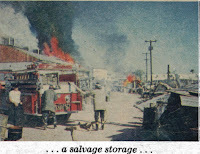 The Phoenix Indian School fire was the choice and they have drawers of color slides and half an album of pictures to prove it. “I’m all for Bob being a fire buff,” Mrs. Guildig said. Small girl shoots down a Convair 240. 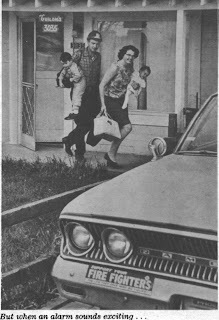 On a visit to Sky Harbor Airport in May of 1972 Kathleen Guildig shoots down an unarmed transport. 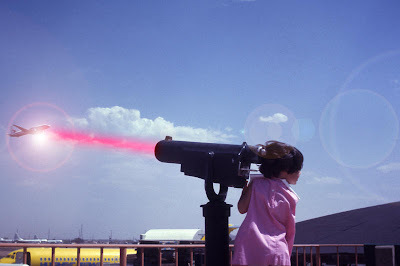 Her parents were reported to say "We didn't know the telescope was loaded". Kathleen's only comment was "Gimme another quarter". This picture was taken just seconds before the plane exploded. Where was it: Vista Del Camino Park (McKellips Lake Park). 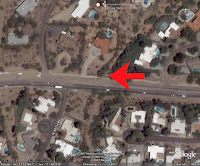 Today I was driving home from an appointment in Scottsdale and drove through paradise valley. I was rounding the bend where Tatum turns into McDonald and then into 44th st. I saw a dry wash with smoke and flames shooting up and what looked like some kids trying to put out a fire. I called 911 at 15:19. The 911 operator reported the Fire department is on the way. I turned around in the hopes of getting some pics. I waited about 2 or 3 minutes and no Rural Metro, as there were high winds and lots of dry desert scrub nearby I pulled up next to the wash in the location on the picture, got out and grabbed my fire extinguisher. The kids were gone and another guy with a drywall pan was dumping dirt on the fire. I started putting out what I could until the fire extinguisher ran out. I then started stamping out what I could get to. The Fire department still had not show up. I called 911 again and they said they would call them again. Rural metro finally showed up around 15:28. 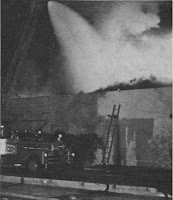 By that time The guy with the drywall pan had 90% of the fire out. I reported to the office on the scene about the kids running away. He barely acknowleged me with a "most likely" comment. So I left. I was to busy helping to get any pics. Last night we went fishing at Chaparral park in Scottsdale. 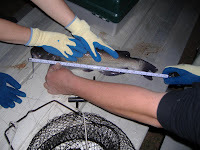 Our aim was to catch some Catfish as we have never caught them before. We were there from about 18:00 to 22:30. 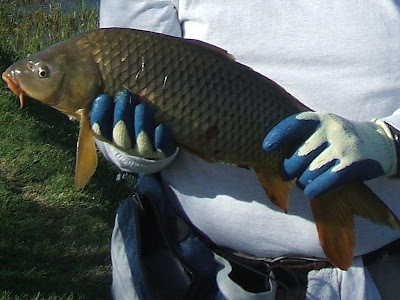 We started by catching several Bluegills to use as bait. We cut the Bluegills up and put large chunks of meat on the hooks. The first person to catch a fish was Amanda she caught a three pounder. Chris then caught a two and a half pounder, later on Amanda caught a four pounder. On this trip I caught only a couple of the Bluegills used for Bait. 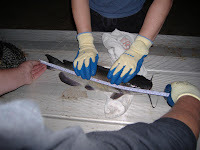 Two of the Catfish swallowed their hooks, one later coughed up his hook and we were able to remove the hook from the third without hurting it. 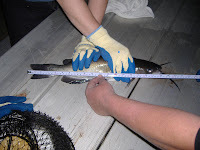 When we were done fishing we released the two smaller Catfish and the remaining Bluegills. We kept the four pounder as Chris has a co-worker who would be quite happy to have one.